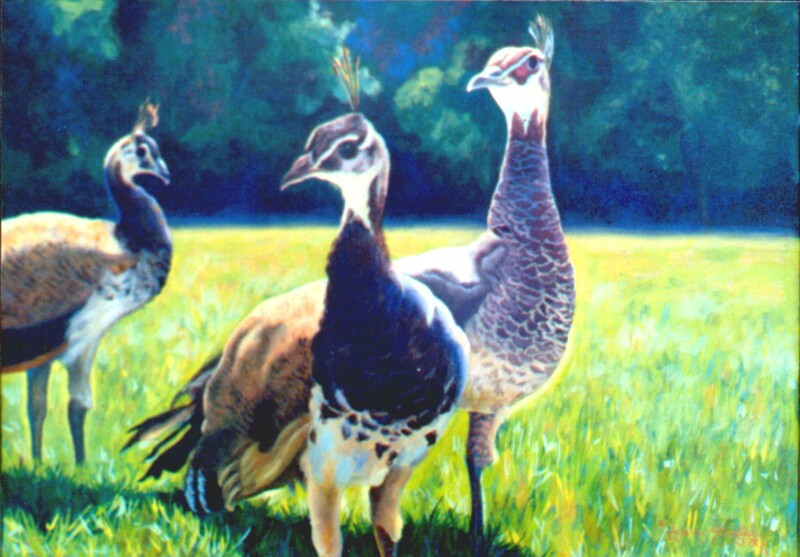 This sunlit painting of ‘Peahens’ also comes with a memory of it being stolen from a local showing. Draw everyday! We artists tend to think that inspiration has to hit us before we start to create. Nonsense! That approach will make the creation of art sporatic and will elongate the learning process unnecessarily. If at all possible, try to draw, even a little bit, everyday. An athelete practices, a musician practices, a writer writes and an artist draws (or paints or sculpts, etc.). If we want to take our skill level up it becomes something we habitually do and we work it into our rhythm of life – on purpose. Use the whole sheet of paper. Start to think overall composition and how to make each area of the paper or canvas attractive. Really observe shadow and light. Make sure there is enough contrast. Squint your eyes to see the polarization of black verses white. If you can’t differientate your sketch when you are squinting then there is more contrast work to be done. Make special note of the outline of your subject. Again, observe intently the shape of the lines and imitate what you see. Would your drawing be interesting if it was only the outside lines? Are the shapes attractive? Look at the negative space. The areas around your subject – are the outlines and negative shapes interesting? Consider texture. Is the texture of the subject you are replicating convincing? Need more observation and practice? Remember to draw what you really see (not what you ‘think’ you see.) Don’t make assumptions about the texture of a familiar object. Try to observe it as for the first time. Enjoy what you do. Be encouraged with progress! Keep older drawings for a sense of history to see how far you have come. And don’t forget to sign and date your drawings for the same reason. You have a unique way of viewing the world – so sign that paper or canvas!